Burnt Sienna is one of the most useful colours in the palette. Whether you are using a limited palette with one of each of the primaries or a split palette with a warm and a cool of each of the primaries, Burnt Sienna is fabulous addition. You can see all these swatches, along with other earth colours, on my website here. 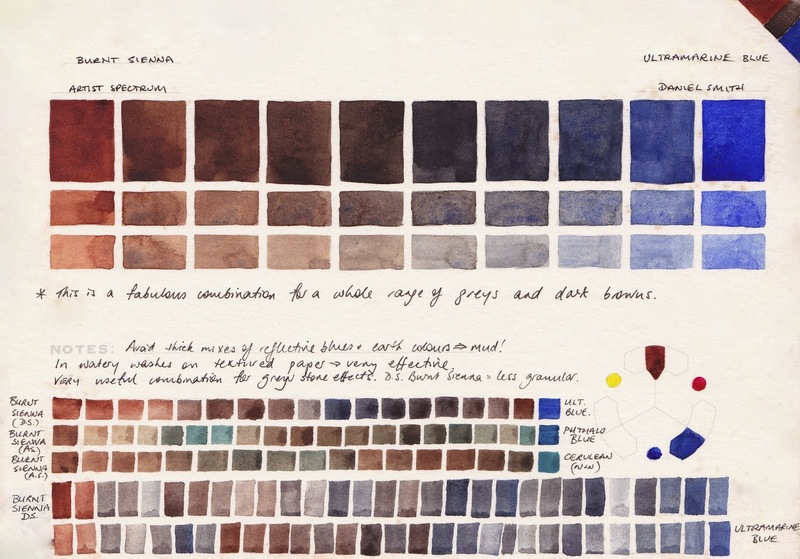 It is possible to mix a burnt sienna hue using a yellow and a red to make an orange, then adding ultramarine to create a neutralised warm brown. But it is much quicker to use a single pigment paint. There are a number of options. Burnt Sienna should be made from PBr7 - a natural earth pigment that is also used to make Burnt Umber, Raw Umber and Raw Sienna. Heating the Raw Sienna pigment creates the burnt Sienna. Some companies use PR101, (which is also used to make Indian and Venetian reds) to make a Burnt Sienna Hue. My preference is for the earthy look of PBr7. Mixed with Ultramarine it creates a warm Indigo, burnt umber hues, lovely greys, stormy sky colours, shadow colours and so on. With a yellow it creates raw sienna hues. With a phthalo blue it creates cool greys and browns. With a crimson it creates earthy indian reds and burnt reds...and so on. Alone, just mixed with water, it creates a perfect skin tone. So which is the best? That depends what you like to paint, whether you like granulation or not, whether you want a more orange colour or a more neutral burnt orange colour. Bottom line: Hemetite Burnt Scarlet Daniel Smith Genuine Hematite, Transparent Red Oxide Daniel Smith PR101, Enviro-Friendly Red Iron Oxide Daniel Smith PBr6, Burnt Sienna Daniel Smith PBr7, Burnt Sienna DaVinci PBr7, Italian Burnt Sienna Daniel Smith PBr7. 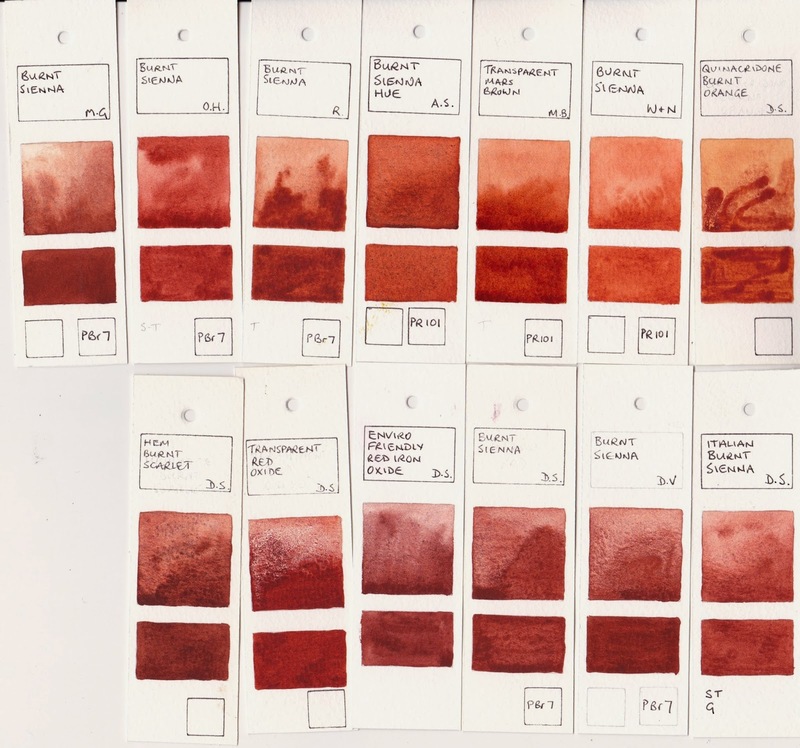 It is clear the options range from an orange through to more red-based browns with more or less granulation. Transparent Red Oxide provides a wonderfully granulating version with a definite orange hue, Hematite Burnt Scarlet is also highly granulating with wonderful colour range. Quinacridone Burnt Orange goes all the way to the orange side so will not neutralise so well, but is quite a popular option for those who don't like granulation, as is the W&N Burnt Sienna (hue). One of the best tests though is how the colour works with Ultramarine and other blues. Here is a range of colours possible with Burnt Sienna mixed with Ultramarine, Phthalo Blue and Cerulean - classic blues in the palette. 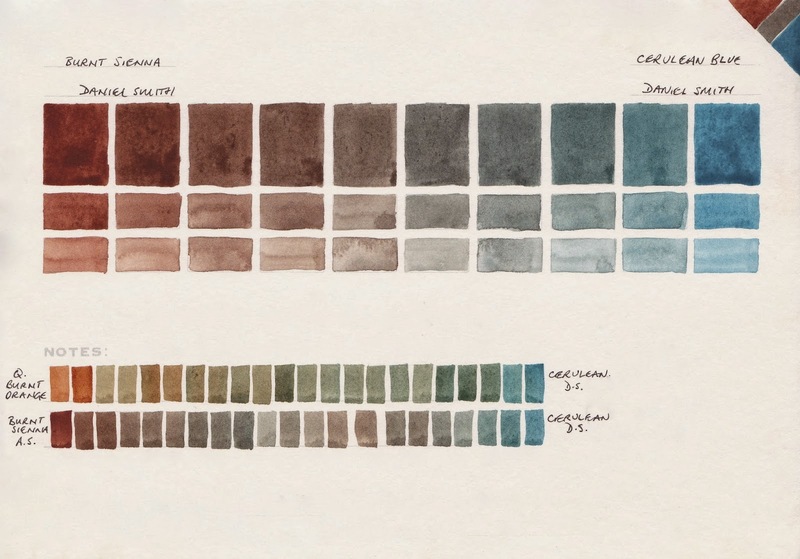 It is the deep greys and browns and blues that I am looking for with Burnt Sienna. Notice how lovely and granulating the Art Spectrum Burnt Sienna Genuine is. I loved this colour but it didn't re-wet as well in the palette as the Daniel Smith and Da Vinci so was superseded. Also notice that Burnt Umber (hue) is readily mixed by adding Ultramarine to Burnt Sienna so is not necessary in a limited palette. Burnt Sienna mixed with blues - Ultramarine, Phthalo Blue, Cerulean. Here is Burnt Sienna with Cerulean. Note that Burnt Sienna creates wonderful greys with Cerulean but with that with Quinacridone Burnt Orange it makes greens rather than greys. Burnt Sienna and Quinacridone Burnt Orange + Cerulean. You can see Burnt Sienna and Phthalo blue on the second line below. Since Phthalo blue is cooler than Ultramarine it will create cooler blues and greys, including creating a raw umber hue. 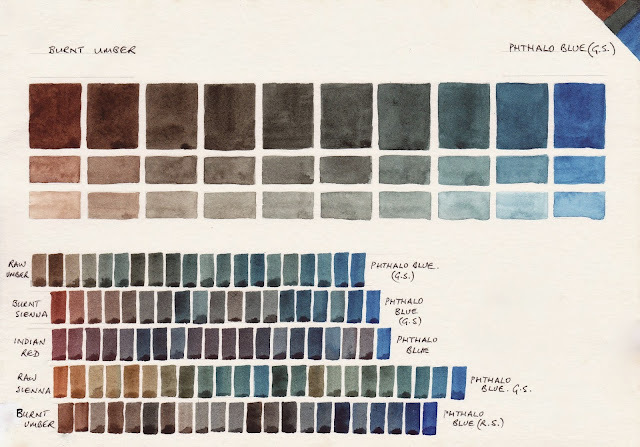 Phthalo Blue mixed with a range of brown pigments - Burnt Umber, Raw Umber, Burnt Sienna, Indian Red, Raw Sienna and Burnt Umber. My favourite is Daniel Smith for a rich earthy version, or Da Vinci for an equally rich earthy but slightly more orange version. Both of these are PBr7. I also love Transparent Red Oxide for special effects so have that as an extra when painting, as well as the DS Burnt Sienna that is always in my palette. Wow! What an informative post! I'm looking forward to making my own charts. These comparisons of paints and colors are so useful. Thank you so much for taking the time to do this. There are a lot more on my website, in the Resources & Tutorials section, where I have arranged them by colour or pigment type. A great favourite of mine and my dear old friend Leonardo.He hasn't told me he was producing paints again ,but then my latin is not very good ! No wonder he is running out of supplies of the Sienna earth . One to add to my list when touring the Mediterranean States and the great capital of Venice. Hans as well ! Who would have thought it of these old acquaintances ,I know they spend much time together now but they claimed they were sharing an easel? I have never heard of the other towns or people you say sell paint and pigments but Lukas and Old Holland are popular here amongst the young people .There was a very reliable supplier in Kremnitz in one of the Principalities some time ago . I was surprised you can buy the earth ready burnt as we used to collect it from the camp fires there after the feasts around Sienna. Yes I wholeheartedly agree with you on this one its wonderful stuff and if anyone was given a choice of one paint frommthe palette ,it would be this one .You can paint a picture completely in just this colour and somehow the mind adds all the colours that are missing !?. Are you related to the Norfolk Blundell's as Arundel and I are attending a to do at their estate next month and you look very presentable in your miniature if I may be so bold ? I love your posts about different colours and the palettes they work in. Thank you, Jane. You are my go-to reference for pigment insights. These color wheels are saving my life !! So amazing and everything I need to be able to visualize color schemes and pick the perfect color combination to paint the rooms in my house ! Thank you, a million times !